We have the fitting original part for you. Guaranteeing the rapid provision of original parts with proven OMNIplus quality for Mercedes-Benz and Setra buses and coaches is our highest priority. Long waiting periods are no longer acceptable in today's climate. For a quick transition from the workshop to the road, the supply and availability of the necessary replacement parts at your service point are an important pre requisite. Professional storage of regularly required replacement parts at the point of sale in conjunction with express deliveries of less frequently used parts from the SpareParts LogisticsCenter makes this possible. Original parts and accessories for Mercedes Benz and Setra buses and coaches with proven OMNIplus quality. Over 130,000 original parts. From engines to the smallest screw. You have access to all standard parts for a period of 15 years. 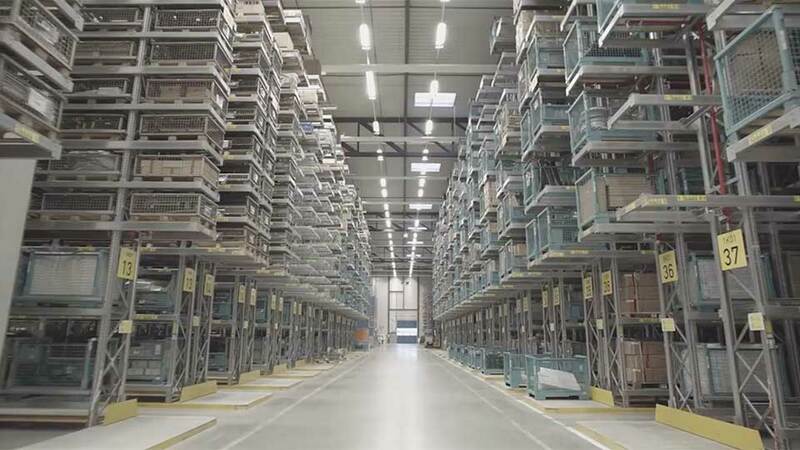 With innovative SAP technology in the high-bay storage facility and the storage areas for medium-sized and large parts, the SpareParts LogisticsCenter always stocks a full range of original parts for your bus. Over 200 logistics experts on the job daily to make sure that your bus is working again in no time. And, should a replacement part ever not be available at one of our service points, it will be ordered from our SpareParts LogisticsCenter, housing the largest bus-specific inventory worldwide, and delivered to your door in the shortest possible time. All across Germany, Europe, and the globe.